FOR SOME CRITICS, the term “holiness movement” has conjured images of navel-gazing holy rollers too interested in getting a spiritual thrill or (at most) saving souls to care about alleviating social distress. This caricature is simply not accurate. The movement’s most enduring legacy is a nationwide network of missions to the socially and economically disadvantaged—primarily in inner-city neighborhoods. Holiness leaders, like their eighteenth-century Methodist forebears, taught that sanctification does not stop in the individual heart, but must overflow into “social holiness.” Just as cleansing from all sin could occur in this life (against the traditional view that it occurred after the soul left the body, to prepare the believer to stand before a holy God), the ideal of the perfect community was also for today—not to be pushed off into the hereafter. To its critics, the reform-minded Christian perfectionism that emanated from such places as Oberlin College and the Free Will Baptist churches of the Northeastern states threatened the social fabric. For example, in Western New York, radicalized churches not only circulated anti-slavery petitions, but even hired African-American pastors and, in a few extreme cases, women. For some, this holiness activism had its limits. Phoebe Palmer, for example, was closely associated with the anti-abolitionist faction of New York City Methodists. In spite of her friendship with Oberlin College president Charles G. Finney, she refused to permit the expression of abolitionist sentiments during her weekly holiness meetings. But in other respects, Palmer followed through on the social implications of holiness. For example, she was greatly moved by the poverty she encountered in New York. Believing that with wealth came social responsibility, Palmer dedicated a portion of her considerable family fortune to relief work. In the early 1840s, she began visiting and distributing tracts among the city’s poor and ministering to the prisoners at the notorious jail known as the Tombs. From 1847 to 1858, Palmer served as corresponding secretary of the New York Female Assistance Society for the Relief and Instruction of the Sick Poor. 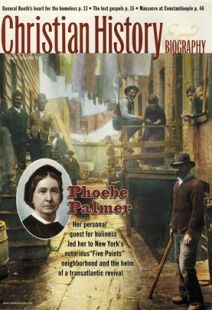 Palmer’s crowning social achievement was the key role she played in the transformation of an old brewery located in one of the city’s most notorious areas into the Five Points Mission (p. 20). No isolated initiative, the Five Points work became the model for later Protestant institutional missions in American cities. Complete with a chapel, parsonage, classrooms, baths, and 20 apartments, the new facility opened in 1850. Next door was the Five Points House of Industry, which provided employment, food, clothing, and temporary housing for as many as 500 poor women and their children. During the last half of the 19th century, holiness bodies operating in nearly all urban areas in North America, Northern Europe, and even Australia established hundreds of urban missions with the intention of providing such emergency services as food, housing, and job training. While other religious bodies established similar missions, few seriously rivaled holiness missions in size or pervasiveness. As late as 1924 a study of the “homeless man problem” in San Francisco found that nearly all emergency food and housing services were being provided by holiness-inspired urban ministries, such as the Peniel Mission, the Volunteers of America, and the Salvation Army. If Roberts turned to the example of Jesus to justify ministry to the poor, others looked to the logic of the Wesleyan doctrine of “holiness” or “perfect love.” As Phoebe Palmer insisted, holiness made one a servant. A servant was one who was “entirely unselfish” and shared in Jesus’ great work of suffering service to humanity. Catherine Booth, who shared Palmer’s views, argued that the question of holiness—"how much like God can we can be? "—was the central question facing the church. In contrast to the cynicism that would later pervade Christianity, the 19th-century holiness revival was profoundly optimistic. As holiness missionaries saw individual lives transformed, they believed social transformation was a distinct possibility. The chief fruit of sanctification was love toward God and humanity. No wonder such holiness luminaries as Charles Finney and Phoebe Palmer often seemed as concerned with temporal human needs as they were with individual eternal destiny. The mood of the movement was positive. As Daniel Steele, a holiness advocate and professor at Boston University, insisted in his preface to Catherine Booth’s widely read Aggressive Christianity, Booth was “no gloomy pessimist, wailing the decay of Christianity.” Indeed, a holiness pessimist was an oxymoron. The Free Methodist Church, a mostly rural denomination, provides one of the best illustrations of the extent of holiness efforts to meet human needs. B. T. Roberts made preaching the gospel to the poor a founding aim of his church. He bequeathed, and subsequent leaders elaborated, a clear and sophisticated rationale for Free Methodists’ ministry among the poor. Beginning in the early 1860s, Free Methodist laywoman Jane Dunning established Providence Mission in the heart of New York City’s African-American ghetto. Dunning and her co-workers fed, bathed, and attempted to minister to the needs of a community that was under constant legal and extralegal harassment dating from the bloody anti-African-American riots of the late 1830s. Over the next 60 years Free Methodists actively fought for the extension of civil liberties not only to African-Americans but also to Asian immigrants. By the end of the 19th century this denomination of fewer than 30,000 members was operating rescue missions and homes for unwed mothers in dozens of American cities. While the work of holiness missions began with providing food and shelter for men, women, and families, mission workers quickly realized that such needs demanded more systemic solutions. The Salvation Army established “industrial homes” that usually included work rooms for the renovation of secondhand furniture and the sorting of used articles, a retail store, a relief department that met the needs of the most impoverished, and a residence for the homeless. Emma Whittmore’s Door of Hope Mission in New York City, one of the many missions ministering to so-called “fallen women,” taught basic skills in gardening, poultry care, and dressmaking to its residents, who shared the profits earned from their work. Perhaps the most successful social program of the Salvation Army was the employment bureau, an American Salvation Army response to the depression of the 1890s that had immediate results. In 1893, the San Francisco Corps found work for 165 men. By 1897, when General Frederick Booth-Tucker established a national employment bureau, 2,600 applications were received for work. Although it took nearly two years to find employment for many of the first 1,975 applicants, the Army was able to report that its success rate approached 100 percent. From its origins in the 1830s and 1840s, the holiness movement was largely a movement of middle-class women. These women generously and fearlessly staffed the rescue missions of the Free Methodist Church, the West Coast-based Peniel Missions, Salvation Army centers, and other city missions. For example, in 1890, Salvation Army Captain Emma Bown sent the first “slum sisters” in pairs into the streets of New York City. Scrubbing floors, cooking meals, washing stroke victims, and simply living among the poor, Bown and her co-workers earned the respect of the people they served. In an age offering few opportunities to women, the Salvation Army and other holiness denominations provided meaningful roles outside the home and avenues of service to the bright, young, idealistic women who were its primary operatives. Because Christian concern for the female victims of prostitution was as old as the Gospel, it appropriately emerged as the focus of one of the primary holiness social ministries. As urbanization spread, “red-light districts” became common features of nearly all major urban areas by the late 19th century. While attempting to minister to prostitutes in New York City, the wealthy New York City druggist and evangelical convert Charles N. Crittenton realized that unless women were provided with career alternatives to prostitution, preaching would be useless. Consequently, in 1883, Crittenton founded the Florence Crittenton Mission, named in honor of Crittenton’s recently deceased daughter, on New York’s Bleecker Street. In 1890, a second mission was established in San Francisco. With the assistance of Kate Waller Barrett, the widow of an Episcopal priest who had entered the experience of full salvation under Crittenton’s preaching, the number of Florence Crittenton Missions grew to over 70 by the time of Crittenton’s death in 1909. Meanwhile, others were duplicating Crittenton’s efforts. In 1883, the Salvation Army opened its first rest cottage for “fallen women” in Glasgow, Scotland. Others followed, and within 10 years, 1,500 women had been received into the United Kingdom’s 14 rest cottages. Half of these had earned their living from prostitution. The Salvation Army opened its first American “rescue home” in Brooklyn in 1886 and within a decade was operating five homes in the United States. In 1896, not wanting to duplicate Christian social services, Crittenton worked closely with such holiness bodies as the Salvation Army and the Christian and Missionary Alliance to organize the National Gospel Mission Union. This body was dedicated to coordinating evangelical social ministries. One notable holiness assault on prostitution occurred in Japan under the leadership of Salvation Army writer Gunpei Yamamuro. The author of one of the most widely read Japanese books of the last century, Heimin no Fukuin (Common People’s Gospel, 1899), Yamamuro initiated a full-scale struggle against legalized prostitution. Promising women safety and training, the Salvation Army “rescue cottage” was quickly overcrowded by women seeking a new start in life. Other religious bodies soon followed the Army’s lead, and the number of prostitutes in Tokyo fell by nearly one-fourth. Most holiness social ministries were more modest. When the British press reported that many working class children went to school hungry, Salvation Army corps responded by providing nutritious inexpensive breakfasts. Especially notable were the movement’s ministries among prisoners. The employment bureaus sponsored by the Salvation Army and especially the Volunteers of America found jobs for literally thousands of ex-offenders. William Kostlevy is Du Plessis Center Archivist and World Christianity Librarian at Fuller Seminary, Pasadena, California.